Cisco agreed to acquire Sourcefire (NASDAQ: FIRE) today announced a definitive agreement for Cisco to acquire Sourcefire, a leader in intelligent cybersecurity, for $76 per share in cash, representing an aggregate purchase price of approximately $2.7 billion. Sourcefire, which is based in Columbia, Maryland, was founded in 2001 by Martin Roesch, author of open source Snort, the world’s most widely deployed intrusion detection and prevention technology. The company claims nearly 4 million downloads to date. 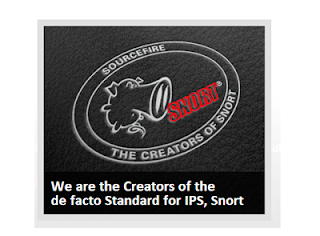 Sourcefire's intrusion prevention solutions are based on Snort. Sourcefire completed its initial public offering in 2007. The company has more than 650 employees worldwide. For the full year ended December 31, 2012, Sourcefire reported revenue of $223.1 million, an increase of 35 percent year-over-year. Cisco said the deal helps it to provide continuous and pervasive advanced threat protection across the entire attack continuum – before, during and after an attack – and from any device to any cloud. AT&T reported Q2 revenue of $32.1 billion, up 1.6 percent versus reported results for the year-earlier period, and up 2.6 percent adjusting for the sale of Advertising Solutions. 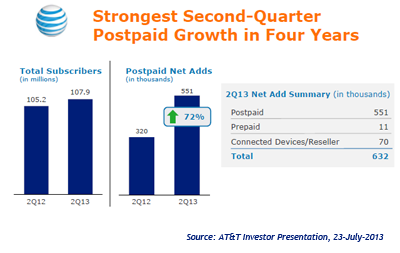 Second-quarter 2013 net income attributable to AT&T totaled $3.8 billion, or $0.71 per diluted share, compared to $3.9 billion, or $0.66 per diluted share, in the year-earlier quarter, up 7.6 percent. Adjusted for a gain of 4 cents on sales of América Móvil shares, earnings per diluted share was $0.67. Kevin Johnson, Juniper's CEO, announced plans to retire once a successor and an orderly transition is accomplished. Johnson said, "It has been a privilege to have served as Juniper's CEO during the past five years. Juniper has an exceptional management team and world-class employees and together we have grown our business and strengthened our position in the networking industry. Networks are being transformed by the rapid increase in traffic volume, cloud computing and the mobile Internet and we are entering a fresh cycle of customer investments in the network. With this positive momentum, I believe it is a good time to transition to new leadership and drive the next phase of Juniper's growth, and I look forward to working with the board to ensure a seamless transition. I am confident in the current strength and long-term potential of Juniper's business, as evidenced by the results of the most recent quarter and the company's proven ability to innovate and execute." On July 23, 2008, Juniper Network appointed Kevin Johnson as its new CEO, replacing Scott Kriens who will continue as chairman of the board and will remain active in the areas of strategy and leadership development. Johnson joins Juniper Networks from Microsoft, where he served in a range of strategic executive assignments over the course of his 16-year tenure, most recently as president of the Platforms and Services Division. Under his leadership, the division achieved record breaking results with over $20 billion in revenue in fiscal year 2008. In addition to leading the Windows business, Mr. Johnson focused on building Microsoft's position as a leader in online advertising and evolving its "software + services" strategy. A10 Networks announced its new entry-level A10 Thunder Series, extending its family of Unified Application Service Gateways (UASGs) to small/medium business and enterprise customers. The 1-RU appliance delivers Application Delivery Controller (ADC) and Server Load Balancing (SLB) functionality for optimization and acceleration, full Layer 4-7 support, scalability and availability. Additional advanced modules include Global Server Load Balancing (GSLB) and Application Delivery Partitions (ADPs) for multi-tenancy through virtualization to enable more applications and more services. It also integrates home-grown services including a Web Application Firewall (WAF) for website protection, DNS Application Firewall (DAF) for DNS infrastructure protection, Distributed Denial of Service (DDoS) protection for next-generation attack mitigation, SSL Intercept (SI) to inspect encrypted traffic and Application Access Management (AAM) for pre-authentication. The A10 Thunder 930 – Entry-level UASG supports 200,000 connections per second (CPS), 5 Gbps of application throughput, and up to 16 million concurrent sessions. Hardware highlights include 2 x 10-Gigabit ports (SFP+), 6 x 1-Gigabit Copper, 2 x 1-Gigabit SFP ports and 8 GB of RAM. All new entry-level Thunder appliances include an Intel Ivy Bridge Xeon CPU, solid-state drive (SSD), hot-swap smart fans and 80 Plus "Platinum" efficiency (best-in-class) power supplies. The Thunder 3030S and 1030S also include Lights-out Management (LOM). Other new models scale to higher performance levels. 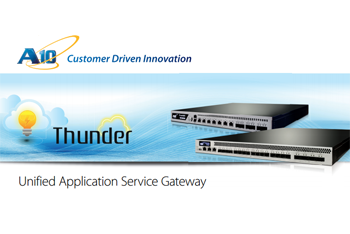 "Our new Thunder models extend the expansive benefits of our Unified Application Service Gateway family to the entry-level and mid-range markets," said Lee Chen, Founder and CEO of A10 Networks. "With the new Thunder 3030S, 1030S and 930 UASGs, customers receive additional value to optimize and scale their existing infrastructure, reduce latency and cost through device consolidation, and increase management efficiency." 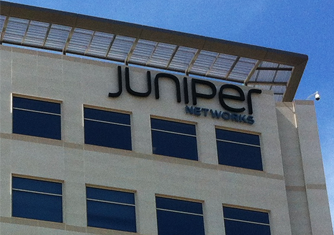 Juniper Networks reported Q2 net revenues of $1.151 billion, up 7% year-over-year and 9% sequentially. The company posted GAAP net income of $98 million or $0.19 per diluted share for the second quarter of 2013. Non-GAAP net income was $148 million or $0.29 per diluted share for the second quarter of 2013. As a reminder, the first quarter of 2013 included an R&D tax benefit of $0.03 per diluted share. Non-GAAP net income per diluted share increased 53% compared to the second quarter of 2012. "We're pleased with our strong second quarter results, which reflect our continued ability to execute on our strategy," said Kevin Johnson, chief executive officer of Juniper Networks. "We continue to see signs of strength in our key markets and we are confident in our routing and switching portfolio. We are also seeing early signs of improving security demand. As we drive innovation to differentiate across our product portfolio, we continue to deliver revenue growth and stay focused on executing with agility to drive value for all our stakeholders." Telefónica announced plans to acquire KPN’s German subsidiary, E-Plus, for 5 billion euros in cash and a stake in the resulting company of 17.6%. Telefónica said it will finance 4.14 billion euros of the cash payment. Under the deal, Telefónica would end up holding a final 65% stake in the new company, KPN will have 17.6% and the remaining shares will be free float. If approved by regulators, the deal would make Telefónica the second largest European operator by number of mobile customers and volume of revenue. It would also improve Telefónica's growth and cash generation profile. Thorsten Dirks, CEO of E-Plus, said "in Germany we are implementing the next phase of our strategy towards a data-centric Challenger, which already resulted in strong postpaid net adds and data growth in the first half of 2013. I can assure you that we will remain fully focused on executing our operational strategy and will be committed to our customers and employees." Broadcom reported Q2 net revenue of $2.09 billion, representing an increase of 4.2% compared with the $2.01 billion reported for the first quarter of 2013 and an increase of 6.0% compared with the $1.97 billion reported for the second quarter of 2012. The net loss (GAAP_ was $251 million , or $.43 per share (basic and diluted), compared with GAAP net income of $191 million , or $0.33 per share (diluted), for the first quarter of 2013 and GAAP net income of $160 million , or $.28 per share (diluted), for the second quarter of 2012. The net loss for the second quarter of 2013 included a purchased intangible impairment charge of $501 million, or $.87 per share, which was primarily related to Broadcom's acquisition of NetLogic Microsystems. "Broadcom delivered solid revenue and gross margins in Q2 with tightly managed sequential growth in operating expenses. This combination of financial discipline and in-line revenue enabled us to deliver non-GAAP earnings per share ahead of First Call consensus," said Scott McGregor, Broadcom's President and Chief Executive Officer. "Looking forward, we see continued growth driven by our industry leading portfolio of wired and wireless communication platforms." Ericsson agreed to acquire Telcocell, a Canadian-based consulting and systems integration company specializing in Business Support Systems (BSS). Fiancial terms were not disclosed. Approximately 200 services employees and consultants primarily based in Canada and the United States are expected to join Ericsson. Telcocell's consulting and systems integration delivers converged charging, custom development, quality assurance and production support for BSS. Paolo Colella, Head of Consulting and Systems Integration at Ericsson said: "Multi-vendor business support systems integration and consulting is of high strategic importance for Ericsson worldwide. Acquiring capabilities from Telcocell will further strengthen our ability to offer full ICT transformation capabilities to our customers, and Ericsson's competitiveness at the intersection where IT meets telecom." The FCC has kicked off a review and modernization of the E-rate program built around three goals: increased broadband capacity, cost-effective purchasing, and streamlined program administration. E-rate was established in 1997 and represents the federal government's largest education technology program. To date, the E-rate program has successfully connected virtually all U.S. schools and libraries (97% of U.S. classrooms) to the Internet. And according to a recent American Library Association survey, one quarter of libraries still have broadband speeds of 1.5 Mbps or less, and only 9 percent of libraries have speeds of 100 Mbps or greater. 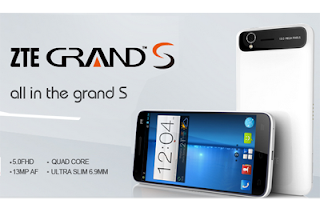 ZTE introduced six new smartphones, including its flagship Quad-Core ZTE Grand X, for India. ZTE is partnering with Calyx Telecommunications to make the devices widely available to consumers across the country. In addition, ZTE is introducing four new data cards together with partner Digilife. ZTE, which ranks in the top 5 mobile handset and smartphone manufacturers, said its new ZTE smartphones are priced between Rs. 5,000 and Rs, 15,000.